"Cut out cookies with a jam filling." 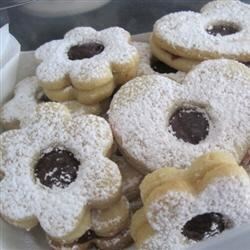 Spread a thin coating of jam on each of the cookie rounds. Set a cutout cookie on top of each, pressing the two together so they make a sandwich. Spoon a dab of jam into the opening of each tart and sprinkle the tops with confectioners' sugar before serving.